In photography, especially when the assignments are third-world in nature, what is the aftermath of the assignment, once you have left; how have you left the location you were in; and what perceptions are you compounding? In the TED video below, Chimamanda Adichie talks about the mis-perceptions she grew up with about the world beyond her purview at her young age. Paul Melcher's Thoughts of a Bohemian had a piece a few weeks ago titled Dying in Africa, critical of those that travel to Africa, and by inference, other third world countries suffering in famine, and his tiring of seeing those images repeated again and again and again. Yet, what is missing, is the 500 Million Rand ($66.8 million US) that South Africa, for example, is spending on tourism advertising to get the message about the positive things about South Africa out. How much money is being spent revealing the underbelly of South Africa - and thus, forcing the country to address is with a zeal equivilent to that of attracting tourists to the posh resorts and shopping? Who did the actuarial tables that showed how much of that R500 million will trickle down to benefit the poor and impoverished? The good staff at the Onion must have read Melcher's piece, or it is a significant coincidence, that the ran this "cover" on their website? There is always the challenge for the photojournalist in the third-world when it comes to the question of arriving in a location, do you pay your subjects? Are you earning more in two days than your subject earns in three years? 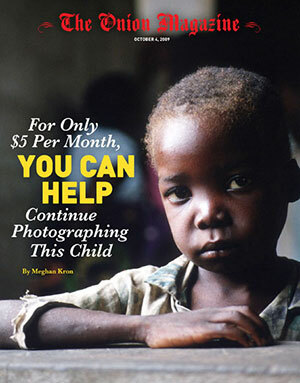 Would your subjects allow themselves to be photographed without being paid, since ethically challenged "photojournalists" have paid their subjects in the past? But wait - if you are getting those model releases that the NGO you're working for (see The NGO Mystique, 10/3/09), you are thus required to compensate your subjects for signing that release in order for the release to be valid, and then what? I don't profess to have the answers here, and this discourse is not new. However, it's an important conversation to continue to have, and hopefully those making photos and assigning them will be more enlightened to the aftermath of the assignment, from multiple perspectives. PicScout Goes On Offense - But Can it Score?